Louise landed in Australia on St Valentine’s Day, 14 February 1997, fresh from the UK, with a personal tradition of lengthy and largely unimpressive university study and long vacation travel. She worked on her cousin’s vineyard in the Adelaide Hills, but found the morning temperatures during grape picking in the bracing Hills Autumn a bit too reminiscent of home, so moved down to McLaren Vale. 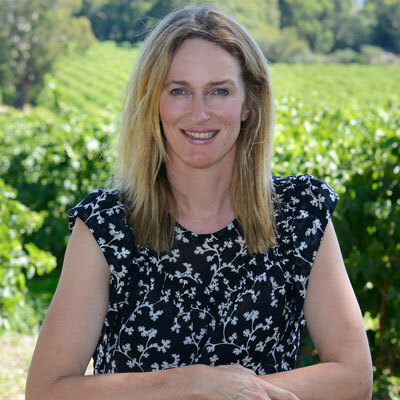 Night study for a Masters in Marketing at the University of South Australia gave her time to make her early mistakes in wine marketing and sales at various McLaren Vale wineries (Tatachilla Winery, d’Arenberg and Penny’s Hill) during the day. Officially retiring from working for ‘the man’ in 2005 she went back to the Bosworth family vineyards to work for the Man – Joch Bosworth – where she took over all aspects of sales, marketing, administration etc. of their wine labels, as well as a sideline of looking after the next generation of Bosworths, Celia (vintage 2004) and Peggy (vintage 2007). Louise is not particularly happy with her hair in this photo, but felt she could no longer use the photo from 2011 any more. False advertising was a phrase bandied about the place.